Once upon a time, in a land you only think you know, lived a little girl and her mother ... or the woman she thought was her mother. Every day, when the little girl played in her pretty garden, she grew more curious about what lay on the other side of the garden wall ... a rather enormous garden wall. And every year, as she grew older, things seemed weirder and weirder, until the day she finally climbed to the top of the wall and looked over into the mines and desert beyond. 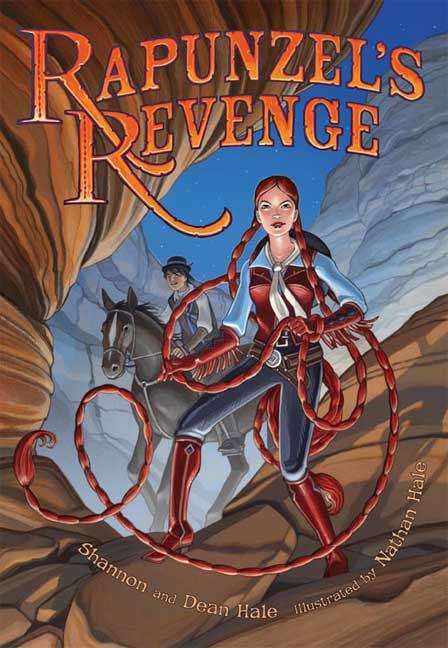 Newbery Honor-winning author Shannon Hale teams up with husband Dean Hale and brilliant artist Nathan Hale (no relation) to bring readers a swashbuckling and hilarious twist on the classic story as you've never seen it before. Watch as Rapunzel and her amazing hair team up with Jack (of beanstalk fame) to gallop around the wild and western landscape, changing lives, righting wrongs, and bringing joy to every soul they encounter.